Another week is coming to an end and that means it is time for a new Sunday Sketch! For this week's challenge, we are excited to have guest designer Jennifer Haggerty from The Cut Shoppe sharing her take on today's sketch using the May "Beach Glass" Scrapbook Kit! Starting with the white cardstock as my background, I cut out the geometric shapes of the butterfly on my Silhouette. I then cut the butterfly in its entirety with the light blue lined Fancy Free #08 patterned paper and adhered it over the top of my background. I also used the multi-colored Fancy Free #06 to back the geometric shapes of the butterfly. I then cut strips from Ombre Wall and Happy Place to adhere across the middle of my page. To accent my photo, I adhered one of the cute Becky Higgins Project Life Chipboard frames as well as layered two of the Fancy Free Emphemera tags underneath. My title is from the Fancy Free Thicker sheet. I loved adding the three bright sequins and cork embellishments along with the small acrylic flowers from the kit on and around the butterfly. To finish, I used two of the sentiments from the clear stamp set as well as added journaling under my title. Now it's your turn! 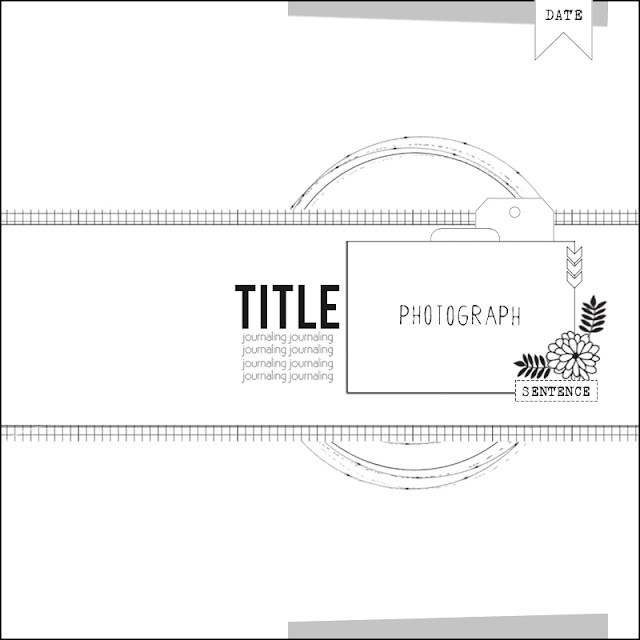 To play along with these week's Sunday Sketch Challenge, create a layout based off of today's sketch, upload it to our gallery with the date of the challenge (5/8) in the title, and you will be eligible to win a $5 gift certificate to be used in the CTK Store! Love, love, love the special take-off on the butterfly. Great use of geometrics in an unexpected way.